A White House conference on poverty? 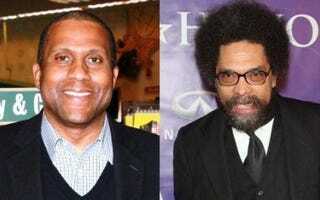 That is one possible outcome that broadcaster Tavis Smiley and Princeton professor Cornel West hope will come out of their 15-city bus tour, they told The Root. The tour, announced this week on CNN’s Piers Morgan Tonight, will travel from Minnesota to Alabama to Tennessee to underscore the plight of poor people of all races, colors and creeds at a time of vast economic uncertainty and rising unemployment in the African-American community, they said in the interview with The Root. The so-called "Poverty Tour: A Call to Conscience" will travel to soup kitchens, Indian reservations and low-income communities. The two will spend the night at the homes of struggling families on three different occasions, they said. Yet-to-be-named celebrities and athletes plan to throw their weight behind the cause, they added, with some participating in different legs of the tour. "You have to raise awareness," Smiley said of poverty. "And you have to put some heat on politicians. The president and Congress are feeling that now. They are going to feel more of that as we get closer to the tour." The chatty dyad, hosts of Smiley & West on Public Radio International, have come under fire from the Rev. Al Sharpton, Tom Joyner and some others because of their repeated criticism of President Barack Obama. Joyner published an open letter accusing them of setting the tone to promote negative dialogue about the president, pointing to Mark Halperin of Time magazine, who called the president a d—-. "These two have done much worse than what Halperin has done because they set the tone for it, opened the door to it, and must take much of the blame for creating a climate that would make a white, professional journalist feel comfortable verbally and vulgarly attacking the first black president of the United States," Joyner wrote. They pushed back at critics in today's interview. "If anyone thinks this is a hate campaign," Smiley said, "they don't understand this really. If the president wants to call a meeting, let's call a roundtable for two or three days on poverty. Why not a White House conference on poverty?" Perhaps Tavis and West can reverse negative perceptions of their discourse with a tour that focuses on the nation's unseen poor. Seeking out solutions should be the main goal. In other news: New Questions in UConn Prodigy Flap.